Using My Powers For Good….and not for Evil! As I’ve mentioned before, I have some expressions that my friends have dubbed Gailisms. For the most part, most of these expressions have a story behind it or it is really an expression used by my family. I love stories. I love to tell them and I love to hear them. A good portion of my family are storyteller — telling stories about each other and on each other. To me, geneology is boring a sort of family organizational chart. What I love are the pictures and stories. In my family, when we show each other a photo or a drawing made by one of us, we know a story is going to be told. This habit and method of communication extends to my family of choice as well. In this way, we create community or tribe. Many years ago, my youngest brother was telling me about three incidents that involved his thinking bad thoughts and having them come true. I don’t remember the incidents exactly anymore but it involved things like, “you’re going to get hurt doing that,” and then the other person gets hurt. He was talking to me on the phone about these situations and I quipped, “You should use your powers for good and not for evil.” From that point on, if he was nervous about something, he’d email me or say, “Use your powers,” or “I’m using my powers.” Then my sister picked it up and it became a family expression. The use of this expression has extended to my work. We are holding a raffle fundraiser for our social committee in celebration of Valentine’s day. The prize is a basket of wine and chocoloate. When a young coworker came in to buy his tickets, he said he’d better win. Obviously the application of this statement has infinite variety and opportunity for cleverness (at least in my mind). This was around the time I went from a solitary to a Pagan active in a community and this quip took on new power. As Wiccans and Pagans, we believe we do have the ability to create change by bending our thoughts and will to the change we want or need. We also try to use our abilities (powers) in harmony with the Universe. When our actions follow the trail of our mind and the Universe, we create magical change. 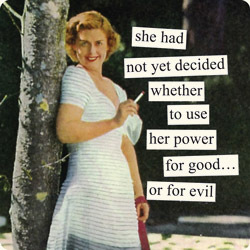 Then, for me, the quip, “using my powers for good and not for evil,” took on a more textured meaning. It acknowledges that we, as humans, do have the power to effect our lives and the world around us, and that we need to act responsibly and with gratitude and compassion. I’ve also quipped that you can tell when it’s going to be a bad movie if the characters over-pronounce certain words: Goddess becomes gawDESS and evil becomes eeeeeeevvvvvvilllllllllle (long, very long e). So when using your powers, know that it is prounounced EEEEEEVILLLLLLLLE. I love this picture. It’s from a photography book published in the eighties or people of the older generation. 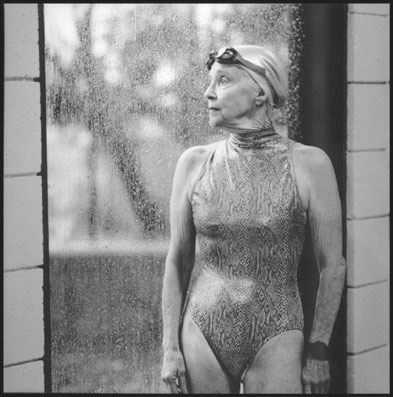 I have this as a poster in my downstairs bathroom and the caption reads, Growing Old is Not for Sissies.” It’s in the bathroom because the room is decorated with all kinds of mermaids. She is one. Old, fit, pensive, and dripping wet. I love to swim. She is a mermaid in all her aged mystery, energy, and power. “Growing old is not for sissies is a quote from the inimitable actress Bette Davis. If you are not familiar with her work, she played strong women with great flair. I’ve learned as I grow older, that I have to explain my allusions and references. When I was younger, I could assume that almost anyone would know who Bette Davis was. Now, I’m not so sure. It was a weird and lonely realization that I am talking to generations who do not share my past, my cultural references, or what I used to think was common knowledge. No matter, I’m not afraid to explain. One of the other realizations I’ve had is that I’ve become like those oldsters when I was a kid, telling long, boring stories with no particular point. I’m not afraid to bore you with them because I’m enjoying my own stories. Apparently talking to me and being my friend or acquaintance is not for sissies, either. There are a lot of things in life not for sissies. We need courage to be our authentic selves and to engage in life. Wicca is not for sissies. You probably judge me as wrong because Wicca has an underserved reputation as all love and light, being dubbed “fluffy-bunny.” To be sure, there are people determined, in the name of Wicca, to turn a blind eye to the dark and negative, people who are afraid to confront their own stuff. However, there are many more who are bravely engaged in the magic of change. Many people believe Wicca is unrealistic and fluffy because of the ethical statement, As it harm none, do what you will. On the surface it may seem to be an unrealistic “law.” It’s not possible to harm none. I think of the Rede as a guideline or a standard, but more than that, it is a call to be responsible for our actions, decisions, and indecision. The gods that call us to their service demand much of us. We must be courageous to walk this path of “making your own religion” because we have no set of commandments to tell us what to do. We endure the consequences of our bad decisions and reap the bounty of our good ones. It’s all part of the flow of universal life energy. Think about all the things you pursue that you don’t want to or you think it’s too hard. Either you have to or you want to with a passion, so you put on your big girl/boy clothes and get on with it. You have moved out of your comfort zone and into the realm of accomplishment, bravery, and wisdom. You are in a sissie-free zone. My favorite Bette Davis movie is All About Eve where she says, “Fasten your Seatbelt, it’s going to be a bumpy night!” She’s a Rowdy Goddess for sure. It started with a naive assumption and a good heart. We were in a pagan group together and we wanted to connect with other pagans. So we listed our names and addresses in a directory of pagan groups. This was back in the day before the ubiquity of the internet, so–hooray!– we made connections when letters started arriving. Here’s the kicker. The letters were from inmates seeking connection with other pagans. I laughingly called my fellow witch and said thank you for the new friends, calling them “felon friends.” The name stuck as we referred to the burgeoning prison correspondence as “the felon friends.” There weren’t many and the few inmates had intriguing stories and seemed very sincere. We sent them our newsletter and wrote personal letters. About that time, I started offering correspondence courses. As a matter of fact, three of the four books I’ve written and published started out as correspondence courses. You guessed it! A good proportion of the subscribers were incarcerated pagans. As I drifted away from my former group, the felon friends continued to write to both of us, or at least to me. Inmates would pass my name on to others and my correspondence grew. It was very absorbing work and I learned a lot about how to deal with inmates. There are few resources for pagans working with inmates and sometimes the advice came from the inmates themselves. Many of them became very protective of me, giving me advice about how to tell the sincere seekers from the manipulators and the fakes. Most of the faithful writers were eager for correspondence courses. I did a Tarot course using Learning the Tarot, and I did a “God of the Month,” using my then unpublished book, The Wild God. So one day I realized I needed to ‘get real’ about this ministry and act like it was a ministry. I organized myself and took my in person beginning Wicca class which I call The Initiation of Athena and divided up into chapters, wrote questions, and designed a course ending with a dedication. I figured it would take a year and a day. what I didn’t figure was the different mail restrictions in different prisons and different states. What I didn’t figure is the enormous time it took to review and comment on the questions, to answer letters, keep good records, to make the copies and to get to the post office. 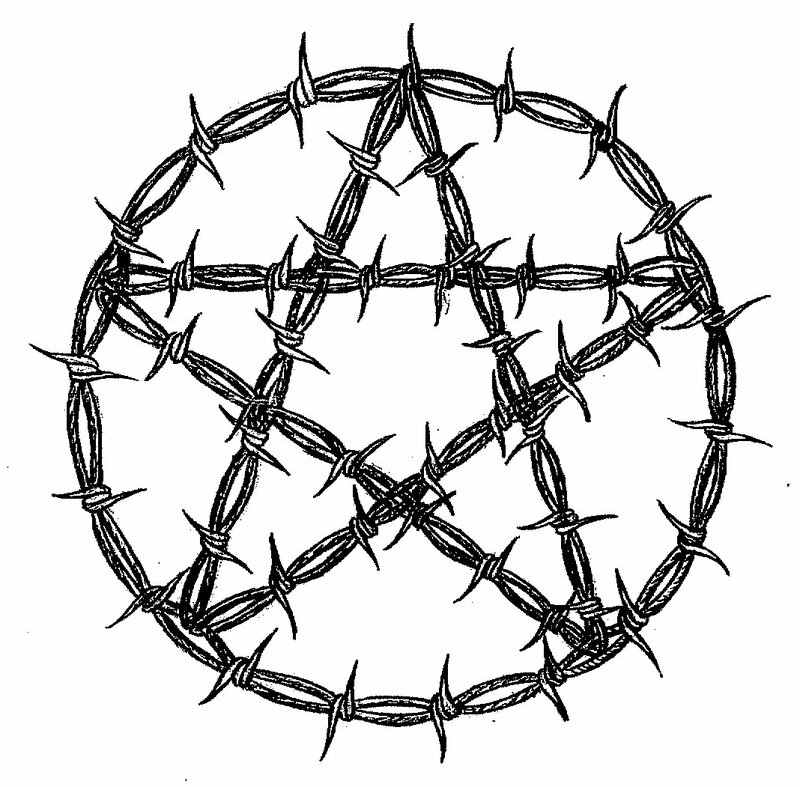 At one point, I formed it as a coven, The Coven of the Barbed Pentacle. We had a newsletter and when someone finished the course, there was a self-dedication ritual and I made up a certificate. The first person to finish was very dedicated and it took almost exactly two years. It was a happy and proud moment for us both. One of the inmates gave my name to a newsletter that went out to incarcerated pagans across the country. I had 100 people, mostly men, in 21 states. To run a correspondence service of this size took most of the weekend and evenings during the week. It took a good investment of money (for postage and copying) and time. Most inmates are destitute but a few would send money or stamps when they could. One of the newsletter issues was financed 100% by inmate donations. A proud moment. I would get phone calls and sometimes inmates would pass my name on to their chaplains or others so I would get calls from chaplains asking for advice on how to accomodate those observing pagan and Wiccan religions. I was a priestess to inmates for more than five years with little help from others (more on that later). It took a lot of time, effort, and expense. It was the focus of my spiritual work, my spiritual practice, and my understanding of service to the gods. It can be and was for me, a burn-out situation. Inmates are demanding, their stories are sad, and sometimes their manipulation is evident but sometimes not. If I skipped a weekend or missed a night of writing letters, I got behind. Their letters reflected anger, disappointment, dismay, and concern. I was getting burnt out. I was getting further and further behind. In some ways, I set myself up for failure. The process I developed was very individual and based on a personal response so there was no way to make this a ‘factory’ approach. One day a letter from an inmate — for whom I’d gone the extra mile — arrived that was a screaming accusation about how I took his money and gave him nothing in return (I used the money for the newsletter) and that I was another in a long line of betrayers of his trust. That was the last letter I read from an inmate, with one exception. Months went by, then a year. I don’t throw the letters out. I keep them thinking one day, I will write a letter of apology and maybe refer them elsewhere. I didn’t end my services to them with honor and I still feel remorse and guilt over that. Meanwhile, I was getting phone calls from the Department of Corrections, asking for information on accomodating pagan inmates observences of their religion. Ocassionally they would want someone to come into the prisons and lead groups. Amazingly, I had been able to find people. It’s a rare and wonderful person who has the right kind of skills to do that. Kudos to all prison chaplains, pagans or otherwise! As a result of some of my consulting, I was named in a law suit last year; the defendant inmate claiming that I along with the prison chaplain and warden were violating his right to observe his . Luckily for me, the Department of Corrections added me to their consultancy list so I was represented by the state attorney general and didn’t have to retain my own lawyers. I just filed documents, answered questions, reviewed documents. Eventually, the case against me was dropped. Yesterday, a letter arrived at my work, marked “legal materials.” It was from an inmate demanding I provide an affadavit for his lawsuit against the Department of Corrections. The letter questioned my credentials and abilities. But more upsetting was that this inmate had my work address because the DOC had sent him a copy of the fax cover sheet. My feelings on this are still rather raw. My sense of privacy is violated and my ability to keep this work separate from my work is also destroyed. Luckily, the people who opened the mail and saw the letter are confidential and trustworthy. And so it will go on. In the next post, I will write some reflections on the process, the call to service, and what I learned from the felon friends. Best wishes and be good, or at least stay out of jail. It is not a nice place. 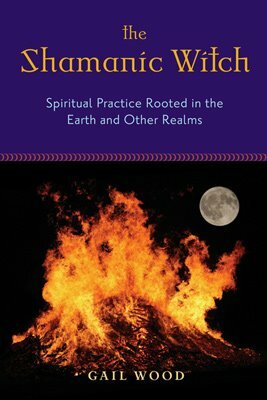 Neo-Shamanism and Wicca: Can We Be Friends? I drew my breath in too. If I were still a fundamental Christian, I’d be saying, “Bad witness, man, bad witness.” That means as the embodiment of our religion, others witness their understanding of that religion or spiritual path by the things you do or say. Quite a responsibility. On the other hand, it is a phase that most pagans including Wiccans go through. We have left the religion of our birth and need to process the reasons for it and what that means for us. At some point, though, most of us cross a threshold where we our message for others to witness is “I am Goddess, I am God.” And that speaks volumes about where we are, but not particularly about where we’ve been. A wise high priestess once told me that in her coven the behavior that we call “Christian bashing,” can go on for a short while, but then if it continues, she goes to the person and says it must stop. All the bashing and complaining serves to do is to demean the new witch, and does not create change. Without change, there is no magic. Wiccans and pagans can be friends with any religion since tolerance and acceptance are one of the outcomes of our ethics. Sometimes within our own community, our behavior creates misunderstanding. Yes, we can be friends with each other as well as the outer community.